No, this is not a picture of my actual quilt, but I did just start one like it with some friends yesterday. Go Shelby! :) We're going to add a border with a bunch of applique, which is what I am excited about (I need to get a little more comfortable in that area). I got 8 blocks done yesterday and the rest of the centers of the log cabin blocks done today. 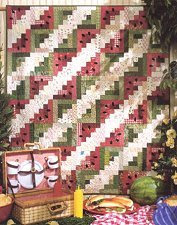 This quilt is called Watermelon Picnic by Black Mountain Quilts. I'm trying to have all 56 log cabin blocks done by next week. I'm crazy. I know. Done by next week?? Yes, crazy! But, I know you can do crazy things like this. thats fun, quilting with friends! What the log cabin one? LOVE the quilt! I love watermelons - what a darling pattern! Everything you touch turns out beautiful, so I'm sure this will be too! Seriously Amber, You're on a roll. I'm excited to see it when you're done. Yes, lets do Kneaders! That would be great. Lets talk soon and figure out a date. What a great pattern....maybe I need to hire you to make a quilt for Harper when she moves to her big girl bed! That is great! You go girl!